In the process of moving, I've been trying to downsize. There were many papers, pictures, and other items I had been holding on to. Some of those items I didn't even realize I still had, for example, the comic strip in the picture to the left. I remember starting to collect those when I was younger. I eventually stopped collecting them, put them in a bag, and forgot about them. Now in the process of moving, I've been trying to really go through my stuff and get rid of what I don't need. 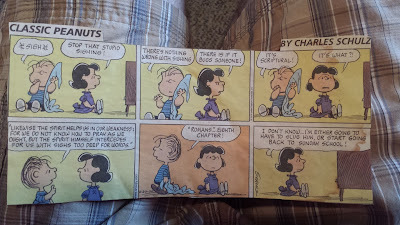 I still thought this comic was cool, and cool that I cut it out when I was younger. I do not need this comic anymore though, so I took a picture of it. Taking pictures of items was a tip I had read on either a minimalism or de-cluttering website/blog. The thought was that when you take a picture of something, you can still look at the object and remember it, but you physically don't have it anymore. I will not take this to the extreme though, and that is something I am not going to talk about on my blog. I will (hopefully) never recommend something to such an extreme of "TAKE A PICTURE OF ALL OF YOUR STUFF AND THEN GET RID OF IT!!!!". In this specific instance, it was fine, and there was really no reason I needed to hold on to this comic strip. I still have a lot of items to sort though, but I'm making a little progress.